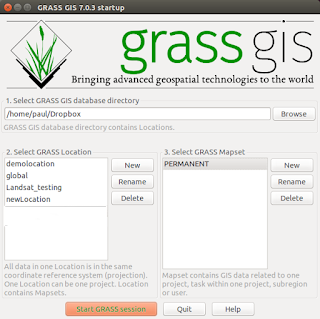 GRASS GIS is an extremely powerful application for manipulating and modelling large raster datasets such as Landsat 8 tiff bands. 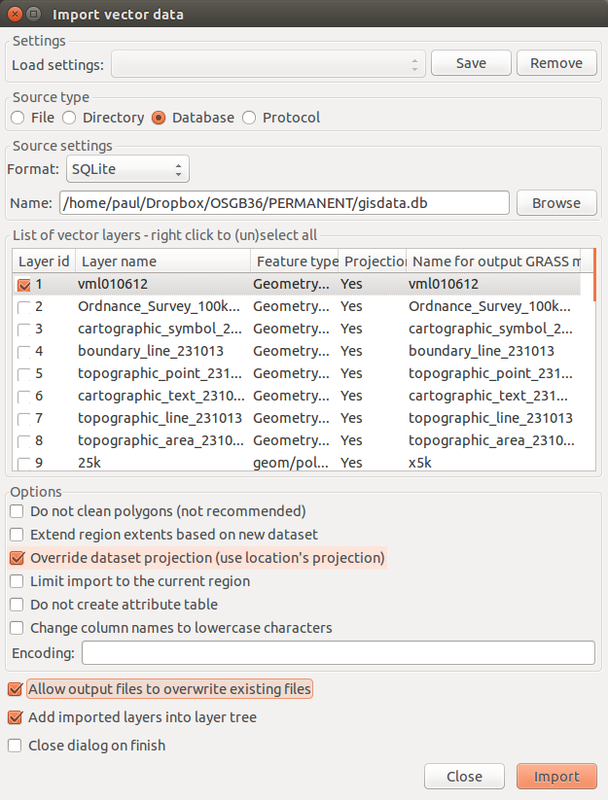 As GRASS users we are aware the application does not implement 'on-the-fly-projections' to ease the pain when adding data in a different projection in the way QGIS does. The grass developers insist doing so would introduce artifacts and some distortions when taking measurements off the overlayed data, so we have to deal with a 'one location = one projection/zone/datum/ellipsoid' combination. How do we get our raster images to underlay or overlay our vectors? The golden rule when using GRASS is if in doubt create a new 'location' any time you want to import or use data in a different projection. I mainly work with just two projections, EPSG:27700 (OSGB36) and EPSG:4326 (WGS 84) and In my case I would define two locations and associated mapsets, one for my everyday working projects in (OSGB36 here in the UK) and one for my working landsat data in (WGS84). 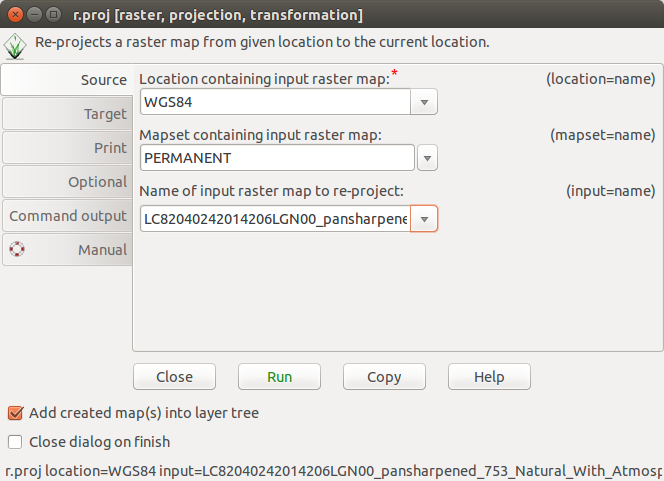 can easily change between these two locations any time and re-project (r.proj) data from one the other. 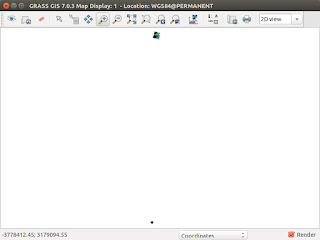 For example I would simply open the (OSGB36) location and use (r.proj) module to overlay data from the (WGS84) location. Lets look at how this is done. 1. Let's open a GRASS GIS session and create our first new 'location' and 'mapset' for our (OSGB36) location using the 'Grass Location Wizard'. This will be my everyday working project location here in the UK. Use the magnifier to find your code if you know it. That's it... the 'Summary' confirms success. 2. 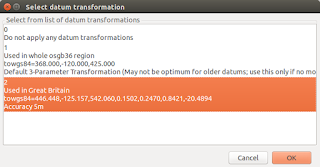 Import your vector data into it with 'v.in.ogr' in the normal way. I'm only going to import one layer from my 'sqlite' database stored inside my 'PERMANENT' directory. Zoom to the full extent of your layer simply to check it is viewable in the projection. 3. Create a second 'location' and 'mapset' (projection code = 'utm' datum code = 'wgs84') the same as in part 1. above. 4. 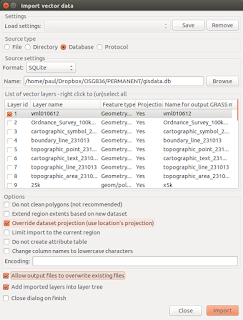 Import all your landsat bands (into WGS84) using 'v.in.ogr' specifying 'override projection use locations projection' this will be your working landsat project location. Again Zoom to the full extent of your layer to check it is viewable in this projection. 6. 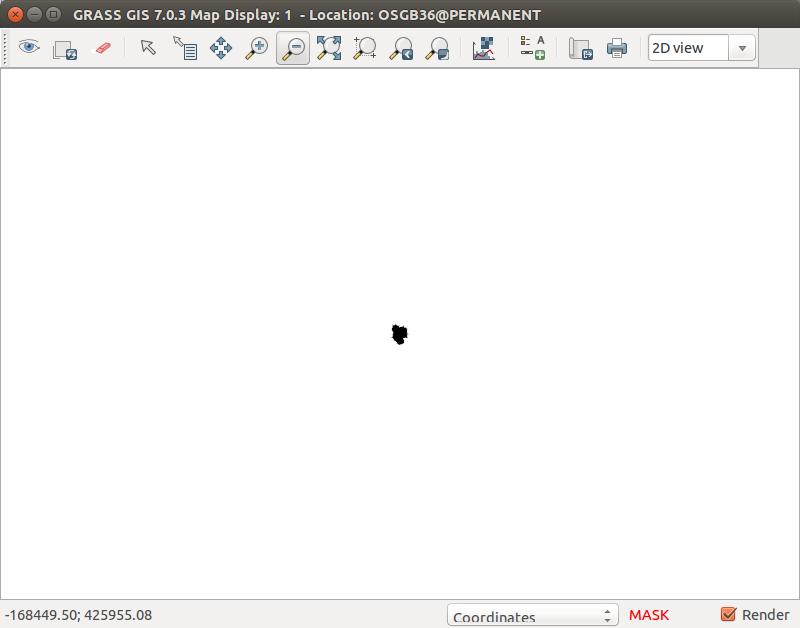 'Zoom out' the display so your data appears no bigger than a small blob (see below) in the middle of the display (this is to allow for the much larger extent of the Landsat tile to fit within the current location parameters of the vector mapset). Click on the '-' magnifier about 4/5 times. 7. 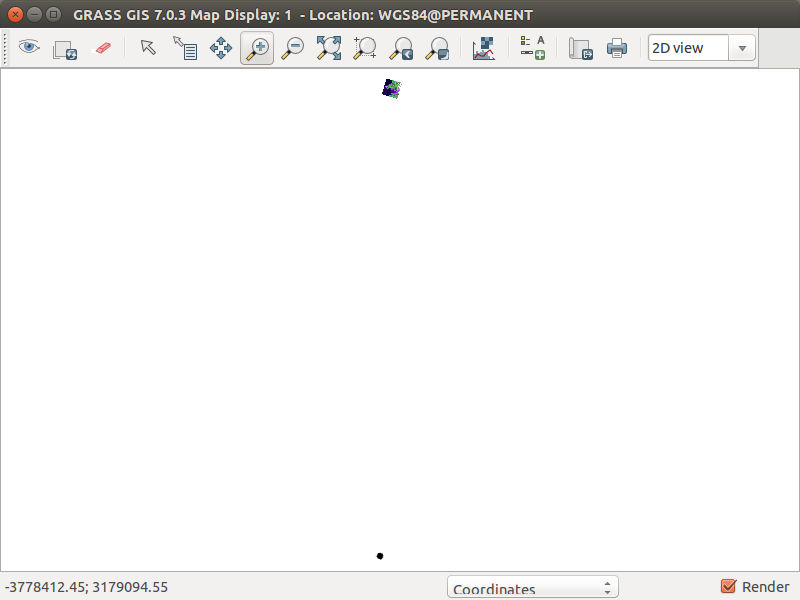 Set 'computational region extent from display' option (under the sixth magnifier from the right) button in the display entitled 'various zoom options') this sets the new extent created in 6. above. 8. 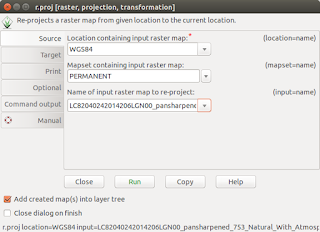 'r.proj' your Landsat image/s you wish to overlap enter text as below and then hit 'RUN'. 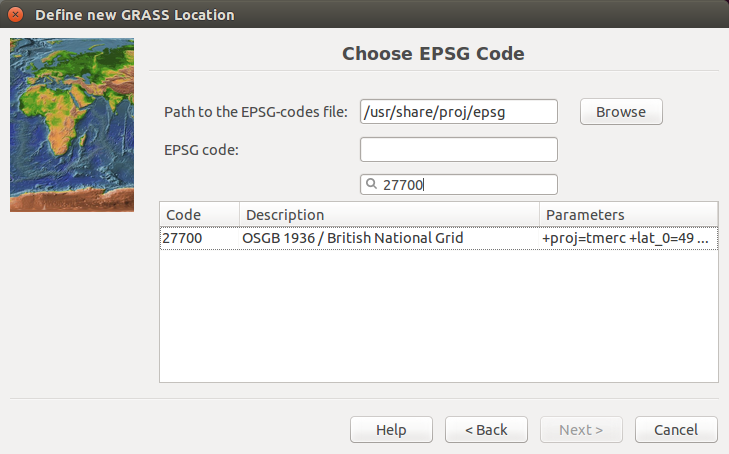 Source Tab is 'WGS84' and 'PERMANENT' and the 'Input' is the raster you wish to load across into the 'OSGB36' projection. Target Tab - leave output raster blank, leave interpolation as 'nearest' and add the resolution to 15m (this may be 30m) depending on what yours is. 9. Both layers will now overlap. 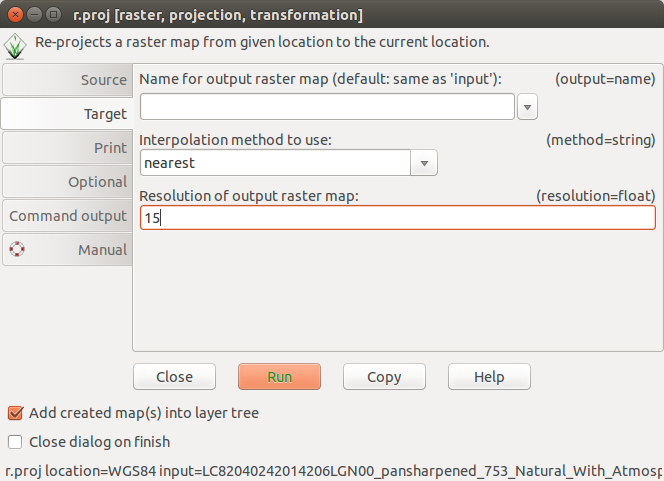 Correctly overlapping vector on raster image. 10. Set 'g.region' to the imported Landsat 8 image. If we import (instead of project) any new raw landsat images through 'v.in.ogr' whilst inside the 'OSGB36' location the new images will misalign vertically because these images are still hardcoded to their 'WGS84' projection/datum parameters even though we are importing them into a 'OSGB36' projection. 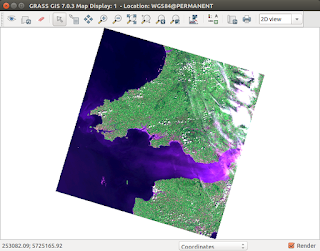 Notice the vertical misaligned vector data in the bottom of the window because i have 'imported' the landsat image (WGS84) (top) into 'OSGB36' location. This can cause a lot of frustration for new users who may be used to 'on-the-fly-projections'. THE GOLDEN RULE: Small 'extents' fit into bigger 'extents', Bigger 'extents' will not fit into smaller 'extents'. If you wish to check your grass environment files (those which control your Grass session in the 'PERMANENT' directory) you can use the following as a guide for checking. 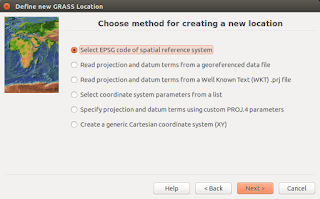 In other words the contents of your 'WIND', 'DEFAULT_WIND', 'PROJ_EPSG', 'PROJ_INFO and 'PROJ_UNITS' files if using Landsat images. Checking your settings (optional) for 'OSGB36' projection. type 'g.gisenv -n' in the command console. type 'g.region -p' in the command console. Checking your settings (optional) for 'WGS84' projection. Thanks for sharing your post. You have nicely presented the concept on this post. 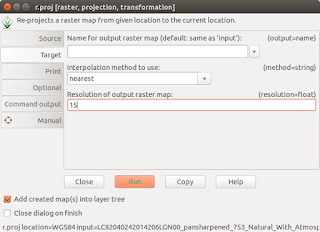 I think, you know about Raster To Vector Service. Your post is very much informative and the method shows a great talent . Thanks for sharing. Always creative writing from your side. That's why I always recommend your blogs to my friends. Thanks again. This is absolutely a stunning post. Your article is superb. Much informative article you have written.We expect more in future. Really enjoyed your article to read.so much helpful.Thanks.keep updating more and more. It's a great informative post for me.Thousands of thanks for this post.Love the blog also. 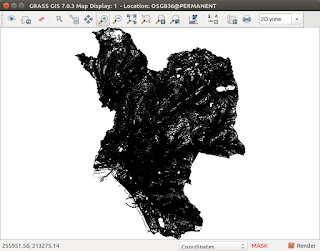 Very effective article about Raster to vector service .I appreciate that your post is so much informative.Thanks for sharing .